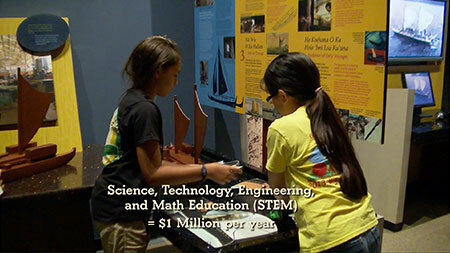 In November 2014, the Thirty Meter Telescope (TMT) launched THINK (The Hawaii Island New Knowledge) Fund to better prepare Hawaii Island students to master STEM (Science, Technology, Engineering and Math) and to become the workforce for higher paying science and technology jobs in Hawaii’s 21st century economy. TMT’s THINK Fund initiative benefits Hawaii Island students pursuing STEM endeavors with an annual contribution of $1 million over its existing 19-year Maunakea sublease with the University of Hawaii- Hilo. Two Hawai‘i foundations were selected by TMT, Hawaii Community Foundation and Pauahi Foundation, to administer THINK Fund distribution in scholarship and grant making platforms. TMT’s annual $1 million contribution allocates $750,000 to THINK Fund at the Hawaii Community Foundation and $250,000 to THINK Fund at the Pauahi Foundation. The foundations administer their respective THINK Funds independently and have autonomy in administering grant funds, determining scholarship recipients, and the selection and governance of Advisory Committees. To date, TMT has funded $5,130,924.85 to the THINK Fund initiative (THINK Fund at HCF $3,848,193.64 and THINK Fund at Pauahi Foundation $1,282,731.21) for Hawai‘i Island students, their families and teachers. In total, TMT’s THINK Fund initiative and Workforce Pipeline Program have funded over $7.6 million to Hawai‘i Island students, teachers and programs since 2014. Grants and scholarships are available by online application to THINK Fund at Hawaii Community Foundation (HCF) and support a variety of Hawaii Island STEM student activities in and after-school, internship programs, and teacher-generated classroom projects. Scholarships support future STEM teachers on Hawai‘i Island as well as students pursuing STEM degrees and training. Since 2015, THINK Fund at HCF has benefitted 26,000 students and 1,000 teachers through support of STEM education on Hawai‘i Island. TMT’s cornerstone funding provided the momentum needed to attract additional donors and launch the STEM Learning Partnership in 2015. • College scholarships totaling over $325,000 have been awarded to 83 Hawai‘i Island students with financial need. • Scholarships support students pursuing careers in STEM and future STEM educators who intend to teach in Hawai‘i Island schools. $1,500,000 from other funders to support innovative STEM programs and activities. • Programs receiving support must demonstrate success recruiting and addressing the needs of groups underrepresented in STEM fields, which includes students in rural communities, Native Hawaiians, and those disengaged in school. • $250,000 has been committed to providing immediate funding for high-quality, ready-to-go STEM projects in Hawai‘i Island classrooms. • High need schools received 78% of the funding. • 39 out of 55 public and public charter schools on Hawai‘i Island have received grants, schools with high need students received 78% of the funding. • Hawaii Community Foundation will solicit proposals to fund programs serving this target group for at least $5,000 per year, beginning this year. THINK Fund at HCF is open to all Hawaii Island students including Native Hawaiians, teachers with STEM classroom projects, and organizations providing STEM programs that directly benefit Hawai‘i Island. Learn more and apply at www.hawaiicommunityfoundation.org/THINKFund. Scholarship Programs are the initial focus of THINK Fund at the Pauahi Foundation. Grant making is being considered for the future. • To date TMT has provided $1,282,731.21 to the THINK Fund at Pauahi Foundation. • TMT’s THINK Fund at Pauahi has funded thirty-four scholarships to date, with all students funded for their entire academic careers. • Twenty-eight students had full scholarships to Science Camps; total of $67,060. • All students are Native Hawaiian. Advisory committee members of THINK Fund at the Pauahi Foundation are Roberta Chu, Kaeo Duarte, Leinaala Enos, David Kaapu, Bob Lindsey, Gail Makuakane-Lundin and Maile Wong. Learn more and apply at www.pauahi.org. Over $1,282,731.21 has been invested to date in Hawai’i island students, teachers, schools, and opportunities. • Hilo Intermediate School – Frameworks for STEM Success! Serena O’Neill, math teacher from Keaau High School talks with Scott at the TMT Mahalo Event, about how the THINK fund helps in her classroom and how STEM helps students prepare for the job market of the future. Kealakehe High School’s robotics team and STEM Academy held its 7th annual Ho‘ike event last week to recognize student members for their achievements and also raise money for the school program. Along with STEM-related skills, junior Maya Gee talked about other important skills learned by students as part of the programs co-sponsored by TMT through the THINK fund.